Okay, so this was actually meant to go out a week or so ago but somehow got put on the back burner here. Anyways, you may have seen these questions over at Sideline Views a couple weeks back about a US Soccer project that someone is doing. I thought the questions were solid enough to write up some answers to and I wanted to share them with you all. Feel free as always to pipe in your own as well. Is U.S. Soccer on the right track in attracting potential fans? Absolutely, I honestly believe soccer is at an all-time high in getting new and potential fans crossed over to the game. It may not exactly be what the US Soccer is doing but what the likes of having FSC and ESPN out there covering the game like nothing we’ve seen before. Are they alienating current fans by playing in less traditional soccer cities? I don’t think so. The US is a melting pot so you will find fans in even the least attractive towns. People love the game in those cities, it’s just sometimes they are afraid to show it. No. That’s the simple answer because in the long-run it helps out. You win over more fans and eventually games like the Mexico one in Phoenix will be a 50-50 crowd and even down the road it will be more pro-US than pro-Mexican. Just takes time people. What does U.S. Soccer need to do to fill the stadiums with U.S. fans, not just soccer fans or fans of the visiting teams? Its another one of those “give it time” kind of answers. But in all reality since the US is a melting pot and a nation full of people from other countries it will be hard to fill a stadium with just US fans only. How many U.S. Soccer games have you attended? Not enough my friends…but that will be changing soon. Of those games, do you find more U.S. fans or more fans for the visitors? Depends on the stadium. Go to Columbus and you will probably see more US fans. Go to a game in DC and you will more than likely see fans of the other country. Its all about location. Should U.S. Soccer have a �home base� where they play their games, or should they continually move them? Absolutely not. No need to single out one stadium or city as the “home base” though some could argue its at the Home Depot Center in LA. They will continue to move things around though for games. Too many good stadiums with good fans to not do this. Should they play in MLS cities? Should they use MLS games and staff to promote U.S. Soccer games? Should they do double headers? Doubleheaders only work in certain areas I believe. And it only works well if you can attract the fans for BOTH games and not just the US game. AND they are really tough on the fans because they typically take place in the summer, which long days at a stadium are no fun for the fan unless they are getting some freebies. 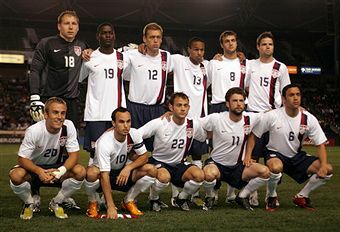 Do you think players like Donovan, Bocanegra, Howard, etc have an impact on fans coming to the game or do fans not care as long as they are seeing the U.S. National Team? I think more and more you will see people coming to US game just to see one guy like a Donovan or a Altidore or even an Adu. People like their stars and if one can get big enough or hot enough then you will see that happen. But right now I think people just come to see the team and there is really nothing wrong with that. What does U.S. Soccer need to do to sell out friendlies (besides playing teams like Argentina and Brazil)? Get to the top of the FIFA mountain. Either become the number one team in all of the land or win a World Cup. Simple as that. With a World Cup on the horizon, what needs to be done to promote the team and support? Winning. Not stumbling early in the qualifying. Do you find the atmosphere of games to be a problem? Nope, because if you aren’t watching the game you really shouldn’t be there. Do you think U.S. Soccer will have more success attracting soccer fans or American sports fans. Soccer fans. Believe me there are plenty out there that are untapped right now. Play to the right card and get the people that know the game first. After that the other sports fans will follow suit once they see how big it has gotten. Do you think that the U.S.’s results in events such as the World Cup affects attendance? Depending on the outcome yeah I think so. If they win it you can bet there will be some sellouts. If they bomb like they did in 1998 you can bet on some tough numbers in some big stadiums. Who is the most recognizable U.S. player? Depends on what you like. For me it’s still Landon Donovan. Some kids probably see Freddy Adu or Jozy Altidore right now as the most recognizable player. But the thing is if you put any of them on a street in New York I would doubt that they would get recognized that easily. Maybe Landon if he was with his wife! Is it better for U.S. players to play for the domestic league or go overseas? It really comes down to the player. Some work well here in MLS. Some work well overseas. Also, for the overseas players it comes down to who they play for and where. Some teams and leagues make for better players, while some leagues and teams just pay better than MLS. What suggestions would you make to U.S. Soccer? Keep things simple, listen to your fans. Other than that I can’t offer too much advise to them because I think they are doing pretty well. It is no mistake that Clint Dempsey was US soccer's model for the new Home Jersey ad…Nuff said. Yes, now that they actually had the nuts to start playing bigger teams, win or lose. Real soccer fans appreciate honesty and even your team is gonna lose to a team like England or Spain, that is better than beating barbados 8-0. No, in the respect that I think people still want to see US Soccer get serious about a coach and letting said coach take our team to the next level regardless of what it takes. No. But until our national team has risen to the level of popularity of a Mexico or Argentina with its fans this will continue to happen almost everywhere there is a large foreign population. I have only been to the HDC and one other venue in California and not there. there are always more US supporters unless they are playing Mexico or another popular South American team. No, I don’t think it matters. MLS does not have to quality to be used for US game promotions, it actually might work the other way around though depending on the city. Maybe on little kids who only know names like Adu, or Donovan, but none of our stars are well recognized enough for raw talent to get that kind of draw. I might be an exception as I do come if I know Dempsey will be in the lineup. These are much just different ways of asking the same question. Or least a lot of them have the same answer… Get a really good international coach, play really good competition consistently, and duh, start winning those games and playing really attractive soccer. Nope, because if you aren�t watching the game you really shouldn�t be there. Do you think that the U.S.�s results in events such as the World Cup affects attendance? Again, different question, same answer…see above. It is no mistake that Clint Dempsey was US soccer’s model for the new Home Jersey ad…Nuff said.